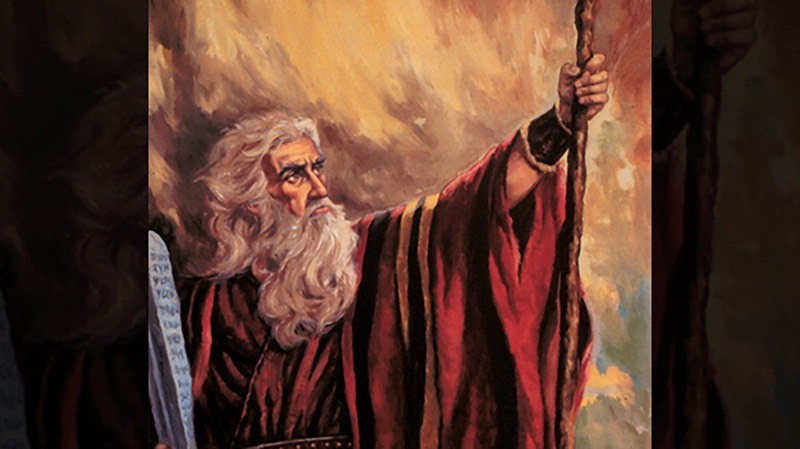 Jews and Christians alike have long considered Moses to be the author of the book of Genesis, which covers everything from Creation through the life of Joseph. It’s important to know that the book’s first intended audience is the Hebrew people in the time of Moses. As we have seen before, Hebrew storytelling often uses elements from a previous, similar story, largely repeating them to make a point. This is the means used by the author to tie together self-contained narratives into a larger line of stories. By placing the story of Noah’s sin at this point in Scripture, the author is deliberately drawing the parallels between his fall, and the fall of man. In Genesis 9:18–29 Noah emerges from the ark and begins farming, just as Adam did when he cultivated and kept the Garden of Eden. Noah plants a vineyard, crushes the grapes, drinks the wine, and becomes drunk. He lays in his tent, naked—just as Adam found himself after he sinned. Noah’s son Ham sees “the nakedness of his father” and greatly dishonors him by not covering him. Then he tells his brothers about it! However, unlike their brother, Shem and Japheth honor Noah by entering the tent walking backward with a garment laid upon their shoulders to cover him—just as God did for Adam by clothing him with animal skins. When Noah awakes from his wine, he knows what his son had done to him (Genesis 9:24) and then pronounces a curse on Canaan, Ham’s son—just as God did with Adam and his posterity. Once again, notice the similarities: Adam had three sons, two were righteous, one was wicked; Noah has three sons, two are righteous, and one is wicked. Noah prophesies that Canaan will be a servant to Shem and Japheth, while Shem and Japheth will receive God’s blessing. But why is Canaan cursed, rather than Ham? The clue lies in the fact that the Hebrews in the time of Moses were the first intended audience for the book of Genesis. Canaan is mentioned by name because the people are to settle in his land. This is a very important message for them! It warns them that the descendants of Canaan are a wicked line, and that they should neither marry nor associate with them—as the descendants of Seth and Cain did before the flood. This story anticipates and foreshadows the wickedness and sexual immorality of the Canaanites, especially at their high places, where they performed many of their religious practices. This story brings up several other important facts. First, in modern American history, the curse on Canaan has often been used to justify slavery. This interpretation is still heard at times today, and has resulted in the unfair demeaning of a large part of earth’s population. However, if we interpret this passage in its proper context, this interpretation is not only incorrect, but is actually insulting, and should never be used! Also, the notion of covering one’s “nakedness” was apparently so important that Moses included it in the regulations for the priests that served in the Tabernacle (see Exodus 28:42–43). When they went near the presence of the Lord at the altar, they had to cover their nakedness by wearing linen undergarments. The message from this story is clear. There are two groups: one that follows in wickedness, and one that follows in righteousness and is blessed by God. While God never takes away anyone’s free will, He does prophesy what the majority of this world’s people will do. What choice will you make today?